In a season where the Selkirk College Saints relied on strong defense for success in the British Columbia Intercollegiate Hockey League (BCIHL), the team recognized the goaltending tandem of Patrick Zubick and Tallon Kramer as its most valuable players. The pair of puckstoppers were a major part of helping the Saints to a second-place finish in the 2018-2019 BCIHL regular season where the team posted an overall record of 13-7-0-4. Though the Saints didn’t manage to capture a fifth provincial title, the team continued to show its strength in a league dominated by four-year schools. At the Saints year-end banquet, the team also recognized several other players for their outstanding contributions during the season. Castlegar native Edward Lindsey took home the Top Rookie and Top Scorer awards, second-year blueliner Parker Wakaruk went home with the Top Defenceman honour, Nelson native Nolan Percival was given the Coaches Award, and Dylan Heppler was named the Unsung Hero. Other honours handed out at the banquet, that took place at the Castlegar Golf Course, included the Spirit Award that was given to captain Jackson Bruce-Fuoco and Zubick. Each year, the team provides Community Service Awards which recognize at least 50 hours of work outside the hockey rink and five players—Joe Gage, Sebastian Powsey, Zubick, Bruce-Fuoco and Percival—were singled out for their contributions over the season. The players who suit up for the Saints over the course of a hockey season are proud student-athletes and achievement in the classroom is always an important element of the year-end banquet. In total, 13 players were given Scholastic Achievement Awards for attaining a 3.0 grade-point-average or higher. 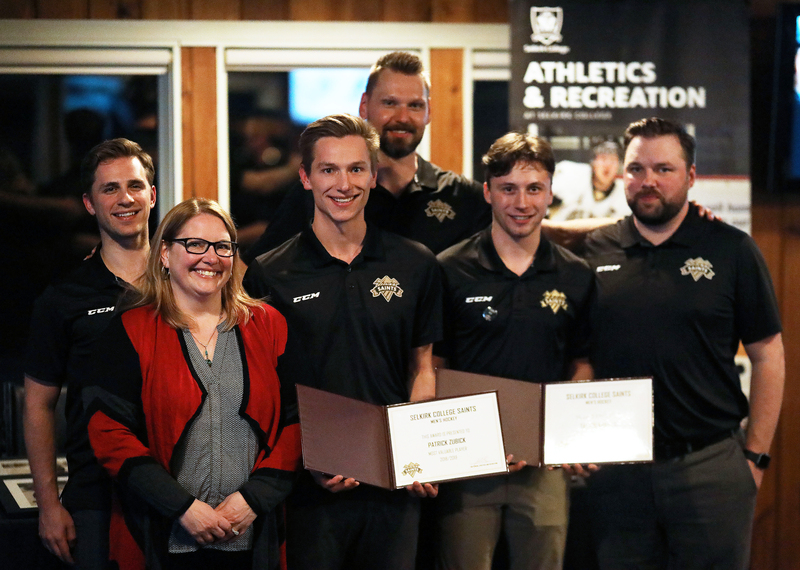 The outstanding student-athletes included Cole Arcuri, Josh Slanina, Brenda Campbell, Landon Walters, Tayden Woods, Kadrian Klimchuk, Powsey, Kramer, Gage, Percival, Zubick, Wakaruk and Bruce-Fuoco. Players who have graduated or confirmed that they will not be returning for the 2019-2020 season were also recognized, including Bruce-Fuoco, Chris Breese, Brady Ward, Arcuri and Zubick. Originally from Ottawa, Bruce-Fuoco was a key figure for the Saints over three seasons and finished his career with Selkirk College sixth on the all-time games played list with 65, six behind leader Ryan Edwards.